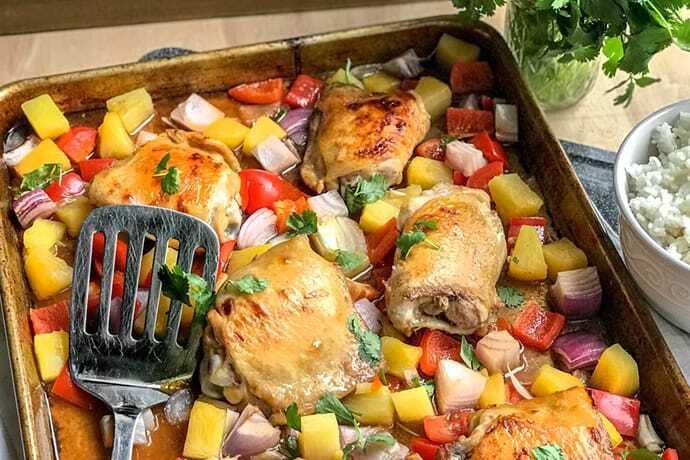 If you’re craving some sunshine and tropical fruit… this Easy Sheep Pan Hawaiian Chicken is for you! 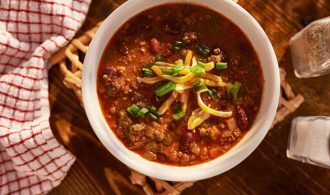 If you’re looking for a quick weeknight meal, this also is for you. 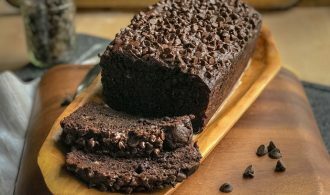 Healthy and incredibly delicious, this is a recipe the family keeps requesting. Like your favorite takeout, only better because it’s made at home. And with one simple pan, the cleanup is a breeze. 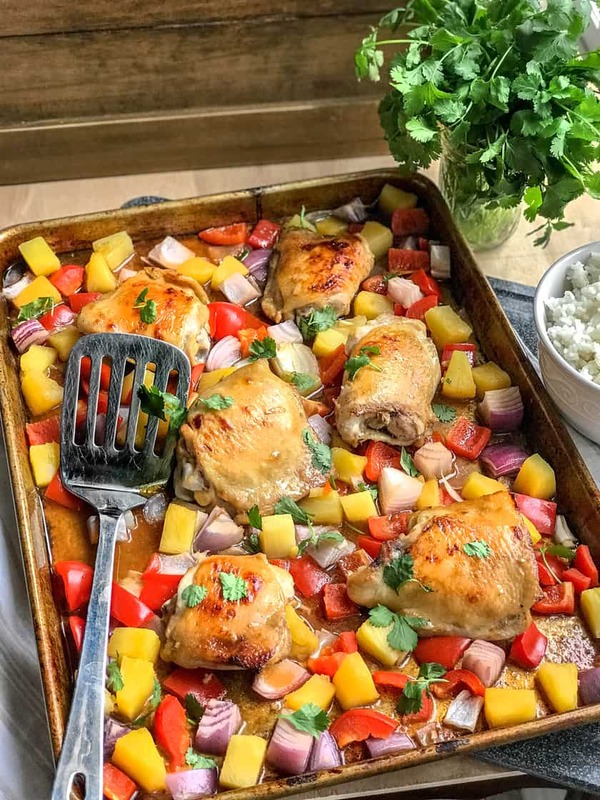 The chicken thighs are crispy, and there is a method to getting them that way (see below), the veggies are sweet and tender with all the flavors you love with Hawaiian food. To make this extra easy, I’ve used canned pineapple chunks, but a fresh pineapple would be amazing. While marinading meat is always, always the most delicious, you don’t have to. Hawaiian sauce and marinade: Whisk together the ingredients for the sauce in a small bowl and set aside. If marinading chicken, reserve 1/2 cup of the liquid and set aside. Pour the remaining sauce into a ziplock bag, add the uncooked chicken, and marinate in the refrigerator 4 hours to overnight. Heat the oven and baking sheet: Preheat to 400°F. Place a rimmed baking sheet in the oven while the oven is heating. Begin with the chicken: Discard the marinading liquid and place the chicken skin-side down in the middle of the hot baking sheet. Immediately return the sheet to the oven, and roast for 20 minutes. Meanwhile, chop the veggies. (If you did not marinade the chicken, spray the baking sheet with nonstick spray and place them skin side down and roast for 20 minutes). Add the veggies: Flip the chicken skin side up. Brush the chicken with the reserved Hawaiian sauce, add the pineapple and chopped veggies to the hot pan. Drizzle remaining sauce over the veggies as well. Bake: Bake until the chicken is crispy, and the veggies are soft, about 15 minutes more. Serve: Serve immediately over rice, garnished with fresh cilantro. How ling do you cook chicken if using boneless, skinless breasts (Weight Watcher friendlier)? Hi Cindy! Yes — boneless, skinless breasts are delicious and more Weight Watcher friendly. You want the chicken breasts to reach 165 degrees F at a minimum. Depending on your oven, this should take around 20 minutes at 400 degrees F. You could bump up the oven to 425 degrees and shave off a couple of minutes.